The Nozomi Young Koi Show will be held on Saturday June 14th 2008 on the grounds of Pan Intercorp in Kenmore Washington. The Nozomi Young Koi Show is open to all hobbyists and typically receives entries from all over the United States. Participats are automatically entered into a drawing for a Free Trip To Japan guided by Pan Intercorp. Pre-registration is required and owners need not be present to win. Call toll free 1-800-827-5819 for details on entering or attending the show. 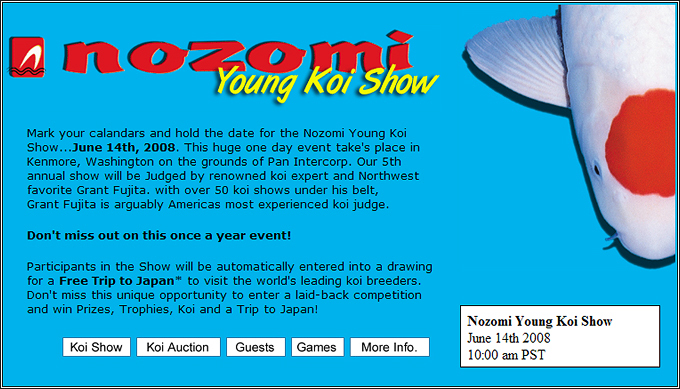 More Info: Official Nozomi Young Koi Show Website.